It is perhaps unsurprising that almost all of the post-match comments and analysis of yesterday’s match between West Ham United and Burnley would centre on the various pitch incursions and protests which accompanied this vital English Premier League. Burnley's ability to keep calm and carry on under extreme circumstances should be congratulated after providing a second half performance which produced that rarest of creatures; an emphatic Burnley away victory. After a first half which produced little to enthuse even the excitable Chris Kamara who was covering the game for Sky's Gillette Soccer Saturday; Burnley took a hold of the game soon after the break, looking more secure in possession and asking ever more impertinent questions of the Hammers’ defence. As with the home victory over Everton last week, it was the introduction of Chris Wood from the bench to partner Ashley Barnes up front which proved to be a decisive turning point. Also like last week, it was a Matt Lowton pass down the inside right channel which produced the first goal; Chris Wood beat a leaden-footed Ogbonna to the ball and delivered it perfectly into the path of Ashley Barnes who thumped it into the roof of the goal from eighteen yards out. That is three goals in three games for the in-form Barnes, a tally which should have been greater had an earlier effort not been incorrectly ruled out for offside. Barnes’ goal had thrown a lit match into what was a combustible atmosphere at the London Stadium, and a few moments later, up popped Wood to pour on a whole can of paraffin. A neat move down the left side saw the ball worked out to Aaron Lennon who squared the ball into Wood’s path, providing him with the simplest of tap-in’s from inside the six yard box. Whether Lennon’s assist was a miscued shot or precision cross is open to conjecture, but I like Lennon, he has made a significant contribution in his short time at the club; so I’m saying cross. Onto the pitch came the intruders, one was wrestled to the ground by Hammers’ skipper Mark Noble, another made a bizarre attempt to plant one of the corner flags on the centre spot in meaningless gesture of defiance, which would have been comic were it not for the implications over the safety of the players. A section of the crowd then gathered in front of the directors’ box to vent their spleen at the West Ham ownership who sat there looking for all the world like an old-style Soviet Politburo inspecting the May Day parade. Their attitude of indifference bordering on contempt hardly helped to defuse the tension. Neither did Chris Wood’s second goal, reacting first after Joe Hart in the West Ham goal had clumsily shovelled a shot from Johan Berg Gudmundsson into the middle of the penalty area. The contrast between Hart’s jittery error and Nick Pope’s flawless performance at the opposite end should be duly noted by England boss Gareth Southgate. Thereafter the game could not end quickly enough and it was in everyone’s best interests that the West Ham hierarchy were ushered away from the stadium forthwith, and at the final whistle the police gathered in force to disperse the protesters. 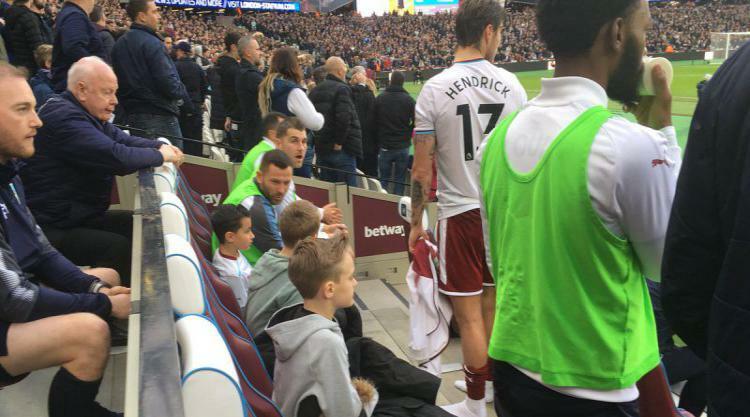 Amidst the anger and the vitriol, it thankfully did not go unnoticed that the substitutes on the Burnley bench all stood to offer small children the protection of their seats. This simple act of decency and compassion speaks well of the players and the club. It is to be hoped that as a result those children will grow up still supporting West Ham, but with a fondness for Burnley and their players. The righteous indignation over the protests at the game is both predictable and understandable; but I would point out that in comparison to some of the atrocities I witnessed first-hand at football grounds in the seventies, yesterday’s events were mild. Nevertheless it was a tough atmosphere in which to play football and Burnley’s players must be commended that they did not allow their concentration, their composure and their professionalism to be compromised. In conclusion I would offer those protesting West Ham supporters the observation that it is not easy to achieve the removal of unpopular owners, just ask fans of Newcastle, Sunderland, Blackburn and many others. And it is almost never achieved through such public displays of rancour. But let us dwell instead on three goals, three points and a record Premier League tally for Sean Dyche and his Clarets’ team as they continue their pursuit of sixth placed Arsenal. This Burnley centric post match analysis was written by uber Burnley fan and regular contributor to Clarets Mad, Dave Thornley (TEC).